Dedicated to my friend Alvaro Rojas, who always liked to smoke a ‘puro’. This photo documentary reports on the tobacco plants and the production of cigars, and is not in any way an advertisement for smoking. The harmful effects of frequent tobacco consumption should not be trivialised! This photo documentary reports on the tobacco plants and the production of cigars in Recôncavo in Brazil. It is in no way an advertisement for smoking, rather it regards the plant of the generic group, tobacco (Nicotine) as the old American cultural plant and the manual production of cigars as the historic and cultural legacy of the ‘homo hedonismus’. Further, I consider the occasional puff of a cigar as a stimulant, which like any other stimulant when heavily consumed can be harmful, and whose consumption must be freely decided by each individual, as long as he or she shows consideration for others, and abides by the customary rules and laws of that respective country. Under no circumstance should the potential harmful effects of frequent tobacco consumption be trivialised! The majority of the photographs are taken with the kind permission of the Dannemann Company, São Félix, as well as its subsidiary, Danco, Cruz da Almas (hereinafter Dannemann in short). However, as far as possible, the text has been written objectively and independently. My gratitude to all the participants for their friendly and hospitable support! The majority of photographs are taken with the kind permission of the Dannemann Company, São Félix, as well as its subsidiary, Danco, Cruz da Almas, and especially from their fields and Head Office in São Félix, Brazil (in the report I have used, for the sake of simplicity, only the term Dannemann). Also, even though, in this short documentary, I want to be as objective as possible, I must admit, that from my very first contact with both companies, I was positively surprised, with regards to their professionalism, ‘commitment’ (we can easily say dedication), friendliness, warmth and above all a quality awareness in all production steps. My gratitude to the Company Dannemann and especially to Mrs. Esther Egli and Mrs. Tanja Kreis (both from São Félix) and Mrs. Karin Brinkhoff (Lübbecke, Germany). I also thank the company, Leite & Alves in Cachoeira, as well as the super friendly small farmers, with whom I was able to photograph at leisure and who answered all my questions with patience. Tobacco belongs to the genus Solanacea, for e.g. the popular psychoactive plants, Belladonna and Thorn apple (Datura), but also like the more harmless potato, tomato or paprika. It is an annual plant, that is, after maturity the seeds die, and depending on the type, it is between 0.5 and 3 meters high. 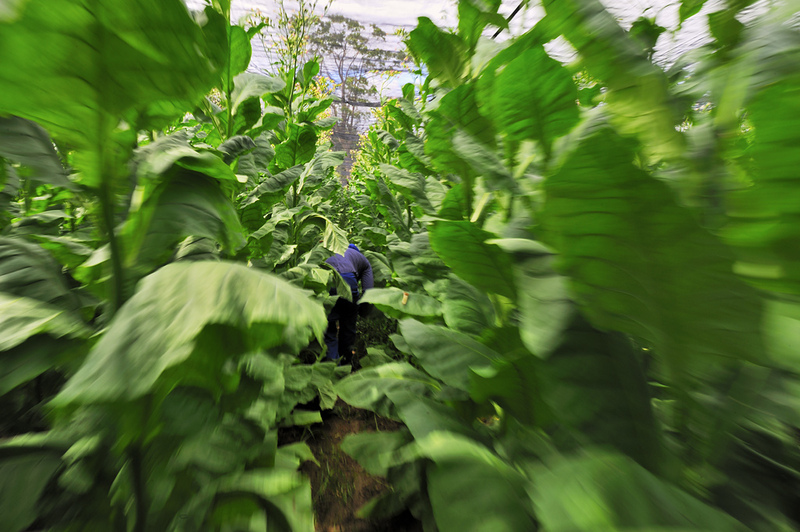 From among the popular types of tobacco, there are essentially two that are used commercially, namely Virginian tobacco (‘Nicotiana tabacum’) and farm tobacco (‘Nicotiana rustica’). 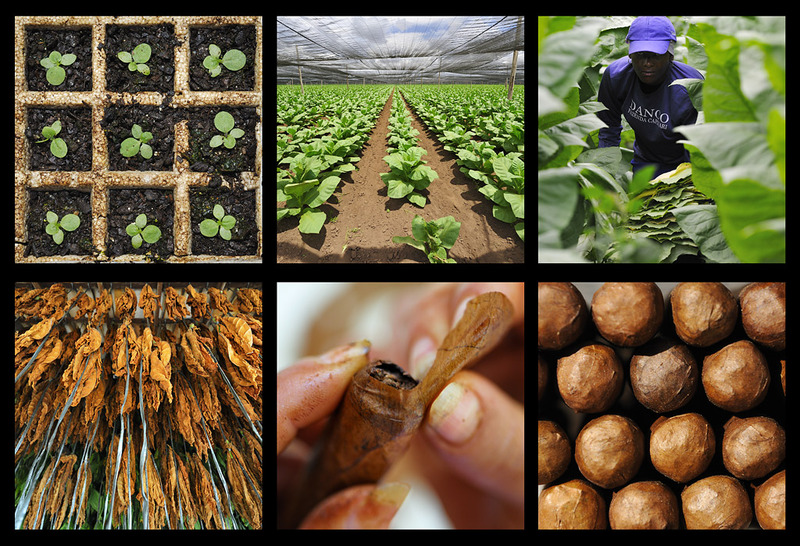 Etymologically speaking, there are various theories on the origin of the word; one widespread theory is that the word tobacco goes back to the Caribbean language and describes originally, not the plant, but a type of pipe (‘tobago’). Nocotine is named after the Frenchman Jean Nicot, who introduced tobacco to France in the sixteenth century, as medicine. 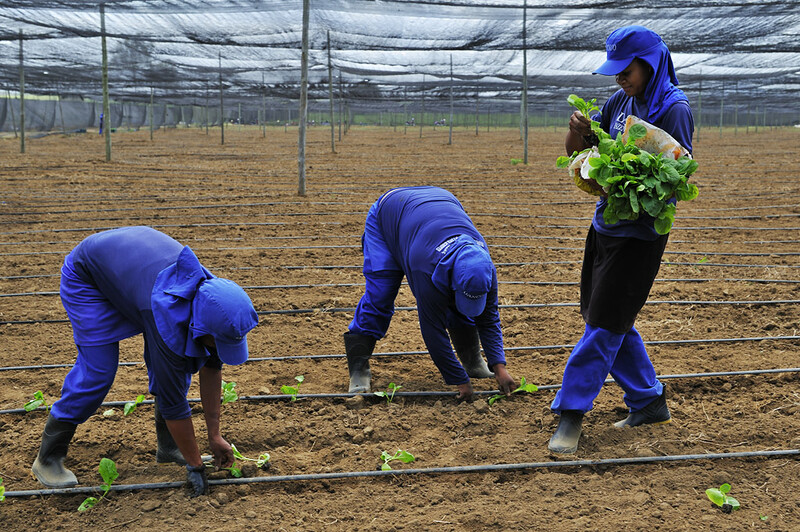 The main regions of cultivation worldwide are the East coast of North America, Middle America, Brazil, Argentina, Syria, Palestine, East Africa and the monsoon regions of Asia. There is no evidence of the origin of tobacco, but it is sure that it involves an American plant and that it was widely present, from Brazil to Canada, even centuries before its ‘discovery’ by Columbus. While the cigar prevailed in Middle and South America, the North American Indians preferred the (Peace-) Pipe. This led to the emergence of different customs among the sailors returning to the European colonial powers: the pipe reached England, the cigar reached Portugal and Spain. The English adventurer and sailor Sir Walter Raleigh founded the North American colony, Virginia, after which the tobacco, produced there, was named. There is no evidence on the origins of tobacco. There is however a consensus that it originally involves an American plant and that tobacco was widely present, from Brazil to Canada, even centuries before its ‘discovery’ by Columbus. It was also used as a medicinal plant, as well as, for ritualistic purposes. In many cultures, tobacco appeared in world mythologies and was considered to be the Gift of the Gods, a sacred plant, comparable to the cocoa. For e.g. the Iroquois believed that tobacco grew out of the head of ‘Mother Earth’ and had a soothing effect, whereas the Maya viewed their Gods as smokers – they explained shooting stars to be discarded cigar butts of the Rain and Thunder Gods. In the Guatemalan region, a clay-fired vessel was found in which a Mayan woman was depicted smoking rolled tobacco leaves tied with a string. While the smoking of rolled tobacco leaves was widespread in South and Middle America, the North American Indians preferred to smoke the pipe (=> ‘Peace Pipe’). It is believed that in the beginning of the sixteenth century tobacco was taken by the returning sailors to Europe, where Jean Nicot, the French envoy in Lisbon, discovered the plant and sent it to his King. The botanist, Dalechamps therefore later named the plant Herba Nicotiana. The introduction of tobacco to France over time led to its spread across Europe; the French court then began to pulverize the plant and used it to snort it as a remedy against headache – this application was widely prevalent for a long time in many parts of Europe and continues to be used even today. The English sailor, Sir Walter Raleigh, founded the North American colony Virginia, after which the tobacco produced there was named – later the English maintained huge tobacco plantations there. [For the aficionados, the tobacco cultivated there: a cross between forest tobacco (‘Nicotiana sylvestris’) and ‘Nicotiana tomentosiformis’ represents the most important commercial form of tobacco today, and from which varied types of tobacco are grown.] Raleigh returned to England as an enthusiastic pipe smoker and made pipe smoking popular in the English court, from where it spread across the whole island. The smoking of cigars was brought by the Spanish and Portuguese from their colonies into their own lands. In the course of industrialization and the acceleration of life associated with it, the younger sister of the cigar, the cigarette became even more popular – and stands even today for quick tobacco consumption in contrast to the cigar or the pipe. In Africa and the Arabic countries as well as Asia, tobacco consumption quickly integrated itself into their existing traditions - the smoking of cannabis and opium was already a part of many cultures. In Arabia, a myth on the origins of tobacco emerged. In this myth, Mohammed was bitten by a snake. He sucked the poison from the bite wound and spat it out. On the spot where the poison touched the ground, grew the first tobacco plant. Presumably, this myth has been adapted to an older myth of another plant. Hint: All small images in this documentary can be enlarged and viewed in a new window by clicking on them. 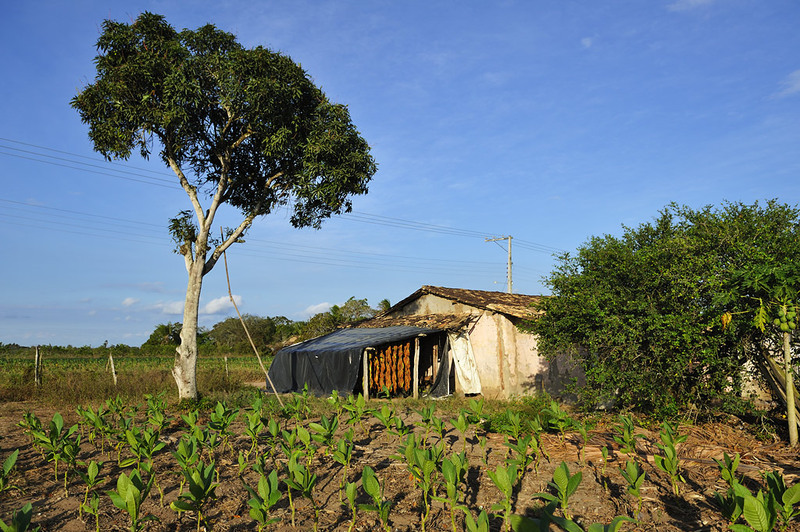 Brazilian tobacco is much older than the discovery of the Americas. For centuries before, the aborigines had planted, smoked, chewed and inhaled tobacco. The Tupinambá trained the Portuguese in the use of tobacco, which was primarily popular amongst the sailors. 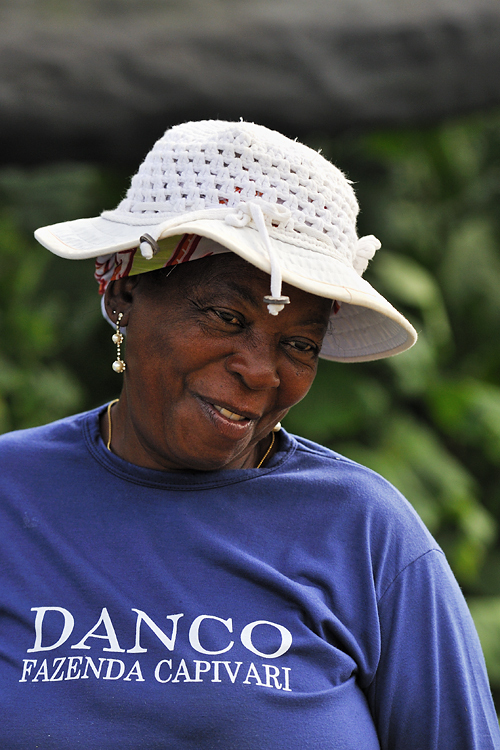 From the mid nineteenth century many Europeans came to Bahia for tobacco cultivation in the Recôncavo region – in the world there were few good cultivation areas that stood out like Recôncavo. Here, besides Dannemann, companies like Leite & Alves (‘Talvis’), Tabacos Mata Fina, Menendez Amerino, Damatta among others had their manufacturing plants. In contrast to the otherwise customary single plant plucking, in this region, the leaves are dried on stems by the small farmers, which lends them a special flavour. Also, the conditions outside are ideal. 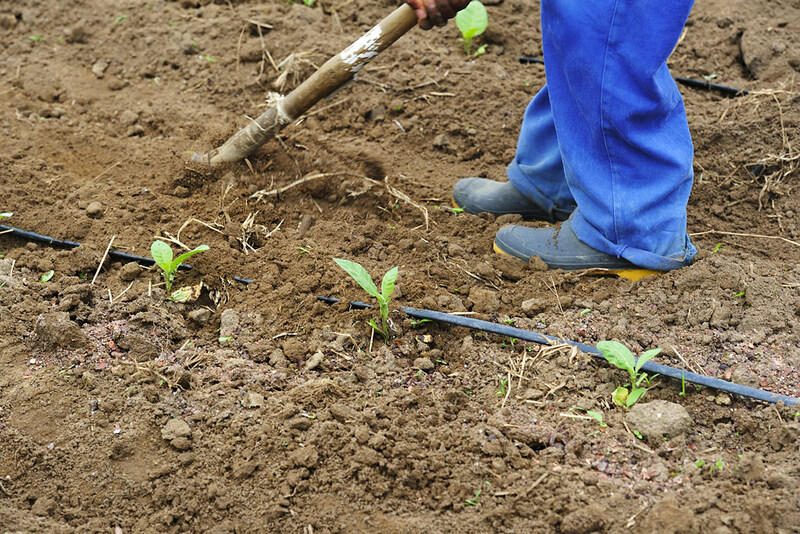 The ground is lightly loamy and sandy, the rain is sufficient and the sun is mild during the period of growth. 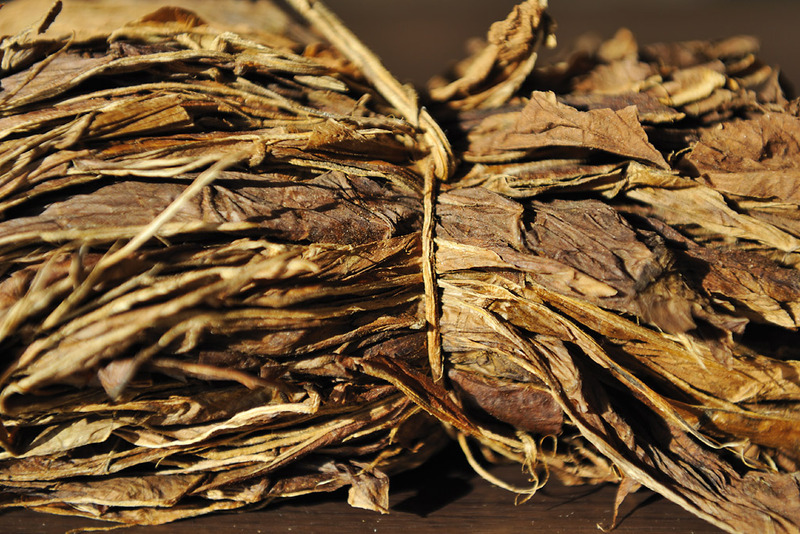 Brazilian tobacco is much older than the discovery of the Americas. For centuries, the aborigines had planted, smoked, chewed and inhaled tobacco. In the middle of the eighteenth century, it was hybridized with Maryland tobacco – as an answer to the then successful Virginia tobacco. This inter-breeding is the source of today’s Bahia-Brazil cigar tobacco. The Tupinambá trained the Portuguese in the use of tobacco, which caught on primarily amongst the sailors. 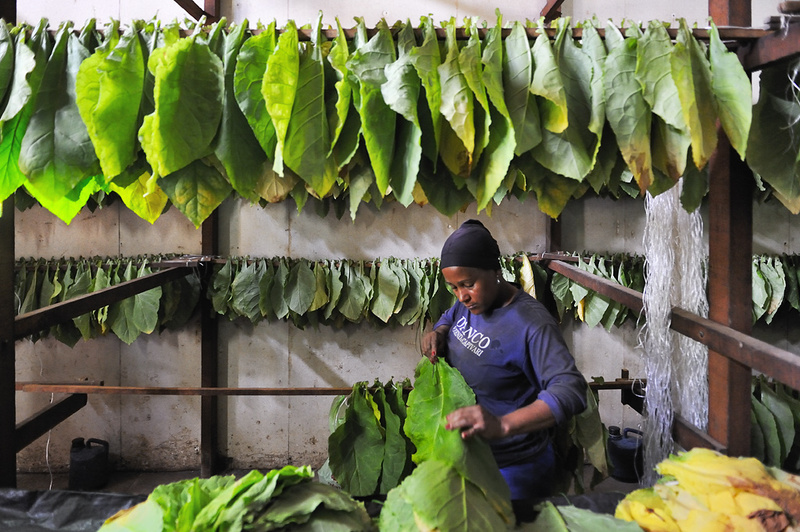 Tobacco, as a commercial product, played an important role not only in Europe, but also in Africa. The tobacco cultivated by the African slaves in Recôncavo was again exchanged on the West African (slave) coast against new slaves. 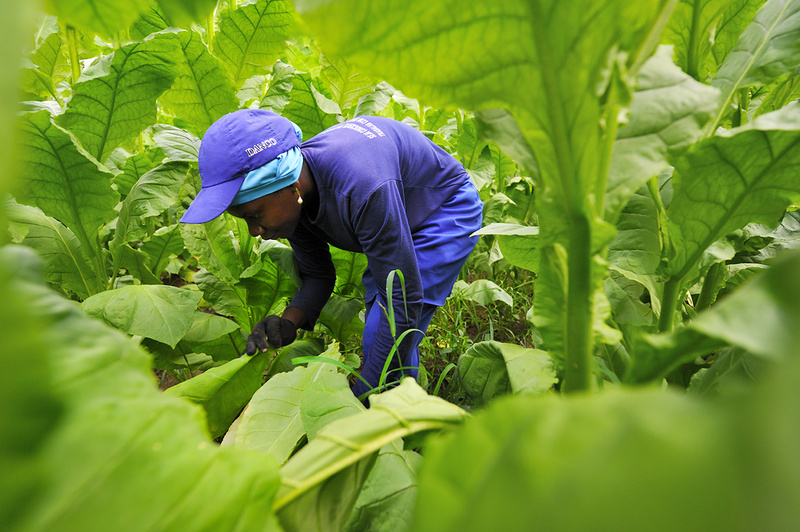 From nineteenth century onwards many Europeans came to Bahia to search for their luck in tobacco cultivation in the Recôncavo region, just like Gerhard (Geraldo) Dannemann. The reason was clear: in the world there were very few good cultivation areas for cigar tobacco that stood out like Recôncavo, in particular the micro-region of Mata Fina. 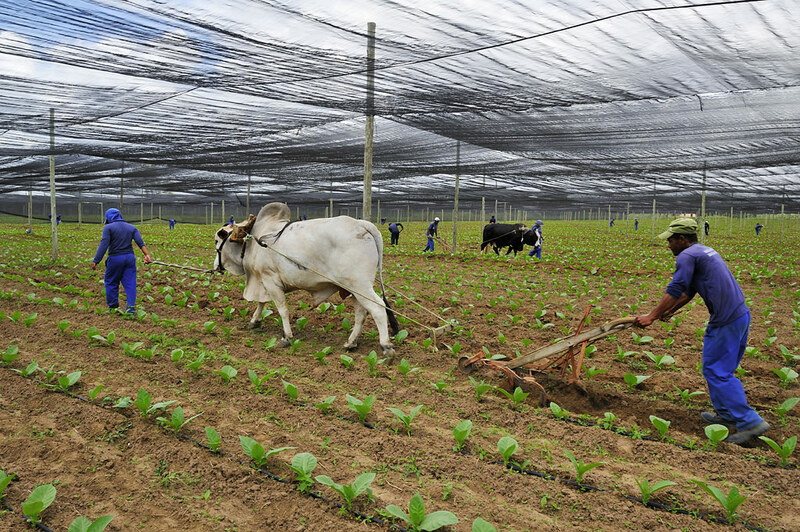 There are two tobacco cultivation areas in Brazil, both are located in the north of the country. The Arapiraca region is located further north and closer to the coast in the state of Alagoas. The Recôncavo in the state of Bahia is located about 500 km south from here. The term, “Recôncavo” refers directly to the outback of Salvador, a region around the Bay of Bahia. The word means, ‘behind the concaves’ after the geographical curvature round the Bay of All Saints. Besides Dannemann, companies like Leite & Alves (‘Talvis’), Tobacos Mata Fina, Menendez Amerino, Damatta, Terra de Vera Cruz Sandes and Angelina, all have their manufacturing plants here. 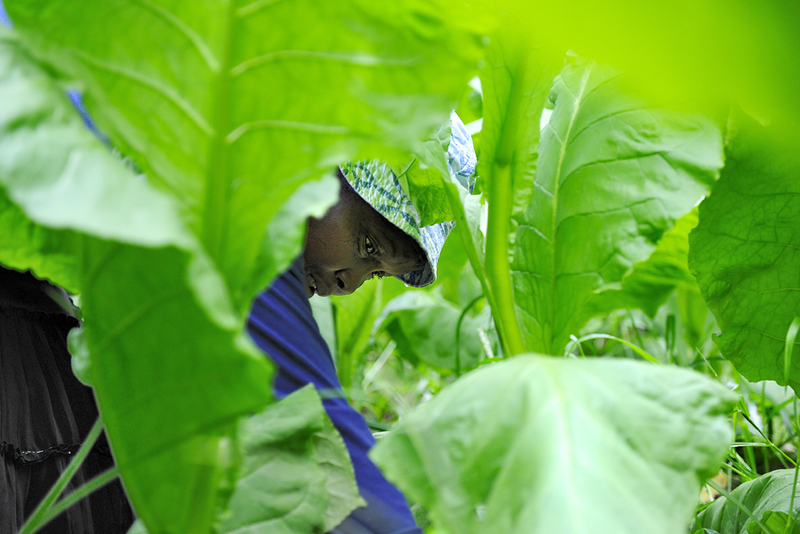 In contrast to the otherwise customary single plant plucking, in this region, the leaves are dried on stems by the small farmers, which lends them a special flavour. Also, the conditions outside are ideal. The ground is lightly loamy and sandy, the rain is sufficient and the sun is mild during the period of growth. The region lies at a distance of only 100 km from the sea and is at a height of 250 to 300 meters above sea level. 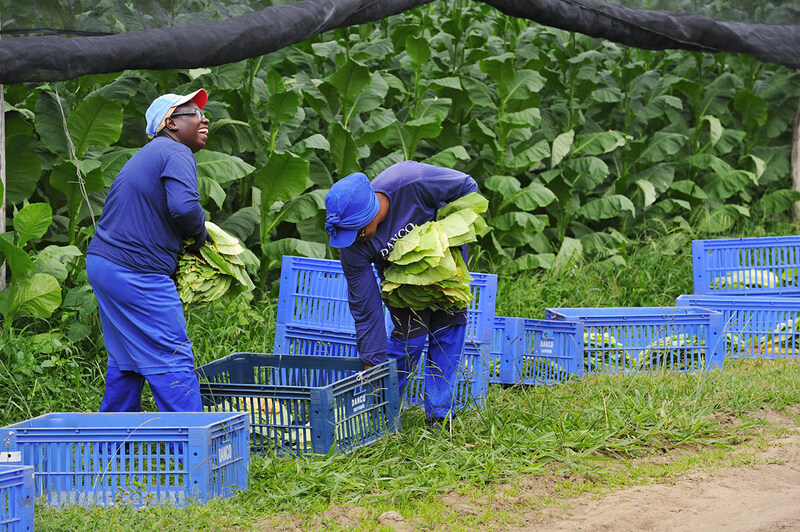 And above all, there were and are enough workers, who are well-versed with the cultivation, harvest and further processing of tobacco. Over the centuries, only cigar tobacco has been exclusively produced here, there has never been any large plantation for cigarette tobacco production in Recôncavo. 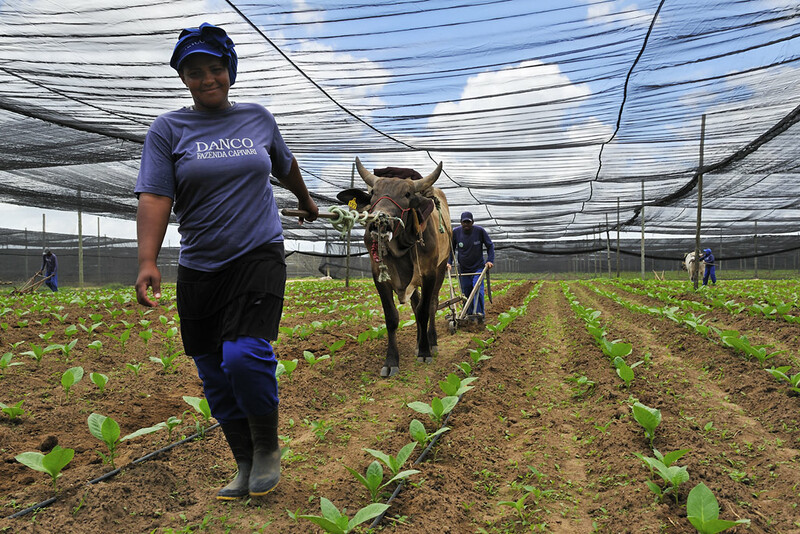 The real Brazilian tobacco is even till today grown by independent small farmers on small plots. The Recôncavo is sub-divided into the following micro-regions: Mata-Fina (the biggest and the best region), Mata Norte, Mata Sul and Mata São Gonçalo – well-known for particularly good wrapper leaves. The dark Bahia Leaf Mata-Fina tobacco and the Bahia Leaf Mata Norte originate from Bahia. 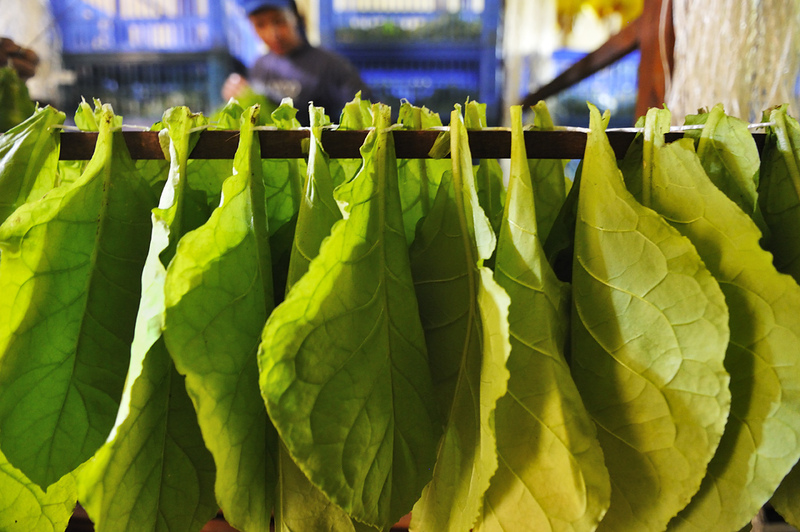 There are also the light wrapper leaf tobacco Bahia Sumatra Wrapper and the Bahiano Wrapper. The Mata Fina and the Mata Norte are further classified into sub districts: In the Mata Fina there is firstly the district of the Cruz das Almas with the villages of the Cruz das Almas (wrappers from Dannemann are grown here), and São Felipe, among others. Here, the tasty and aromatic Mata Fina is grown. 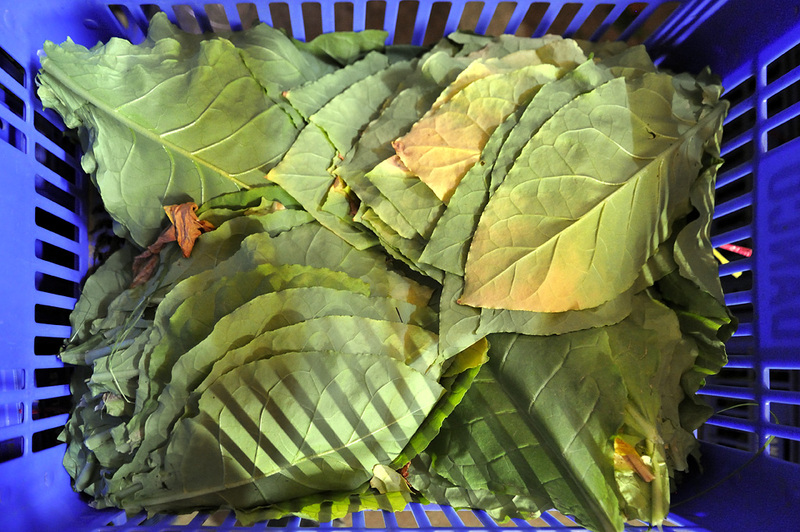 The leaf is in general round and wide; the fermented tobacco has a deep, brown colour. 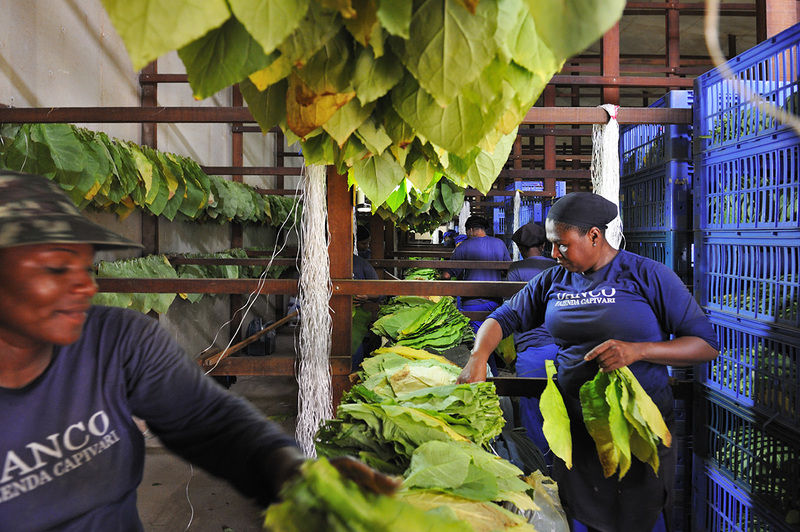 From this, many premium cigar brands are produced in the country. 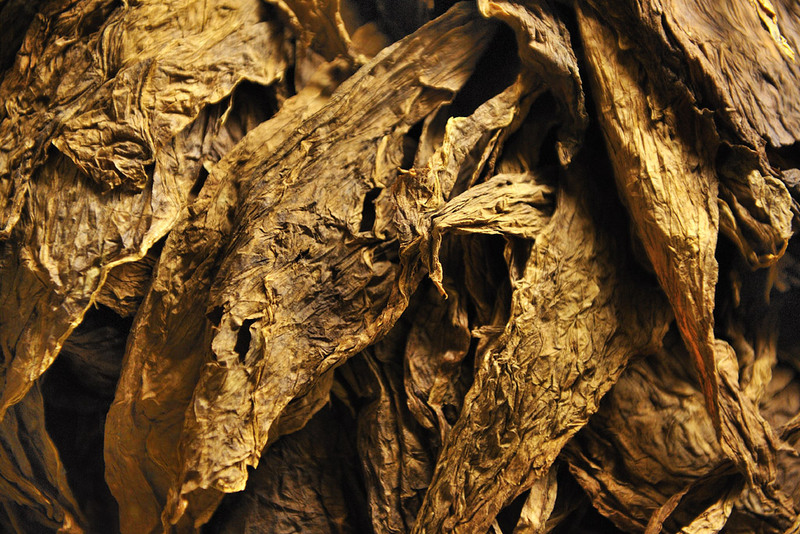 The lion’s share of the Brazilian cigar tobacco is however, exported as raw tobacco, just like in the case of coffee or cocoa. 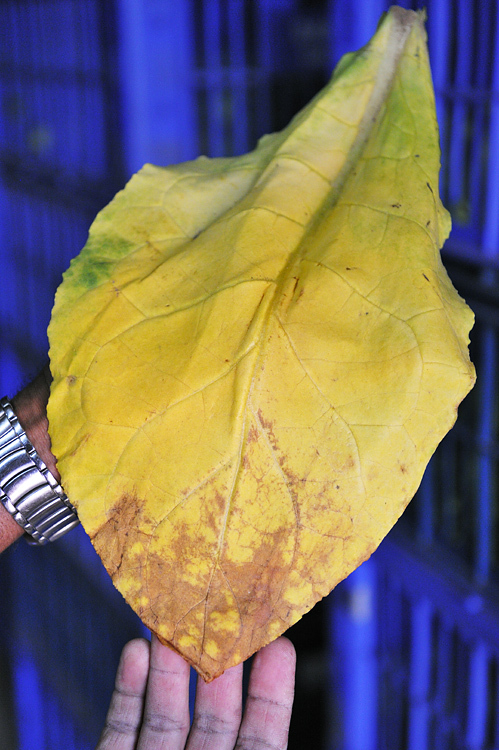 The outer tobacco leaf, the wrapper leaf (‘capa’) conveys, through its colour, structure and aroma, the first impression of the quality of a cigar. Therefore, generally, very high demands are put on the wrapper leaf. 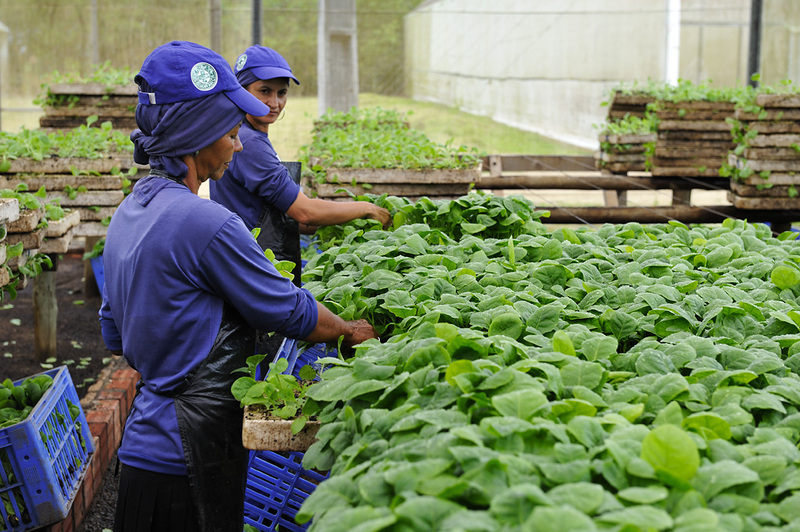 The Dannemann company produces its own wrapper leaves at the “Fazenda Santo Antônio”, so that it can control and continuously improve the production steps. 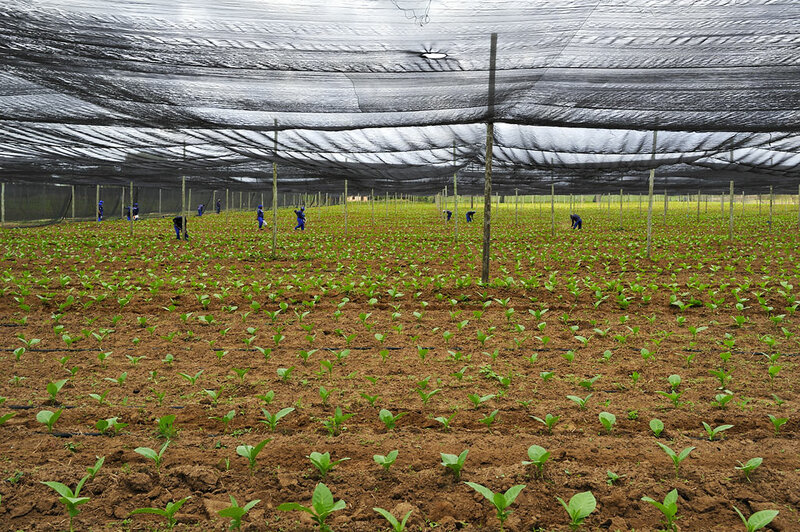 Quality and fragrance of a wrapper leaf are in turn, besides the climactic conditions and soil quality, influenced significantly by the quality of water. 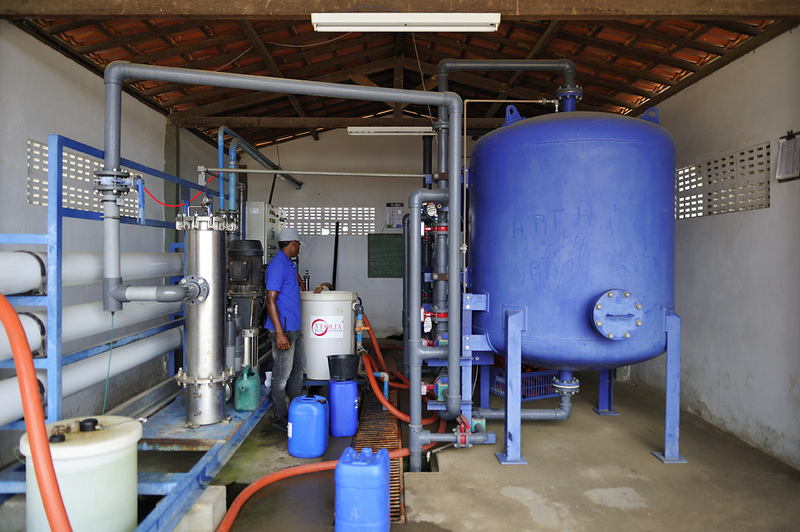 For this reason, the Dannemann Company puts in a lot of effort into the water treatment right from the beginning: it is purified in three different work steps, freed from chlorine and enriched with missing minerals. 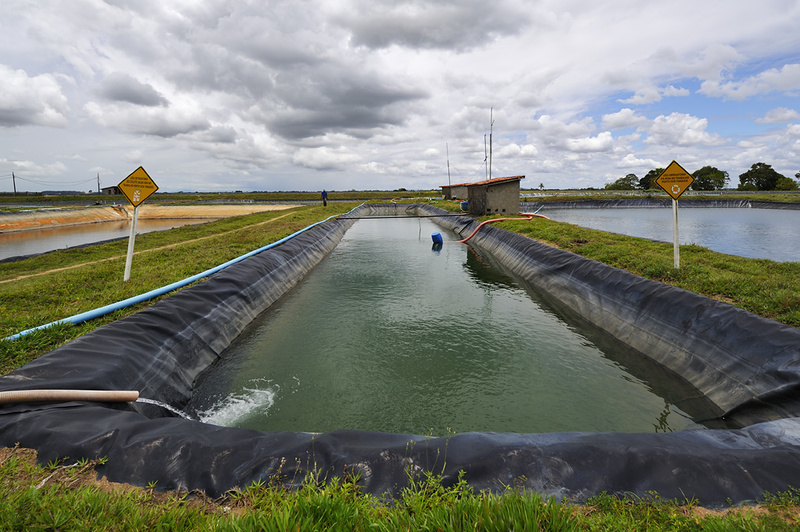 The water supply to the plants is regulated by a sophisticated, computer controlled distribution system, in accordance with the weather conditions, weather forecast, time of the day and size of the plant. High-tech from Israel meets old American crop! Every year kilometers of small canals are dug and pipes laid out. 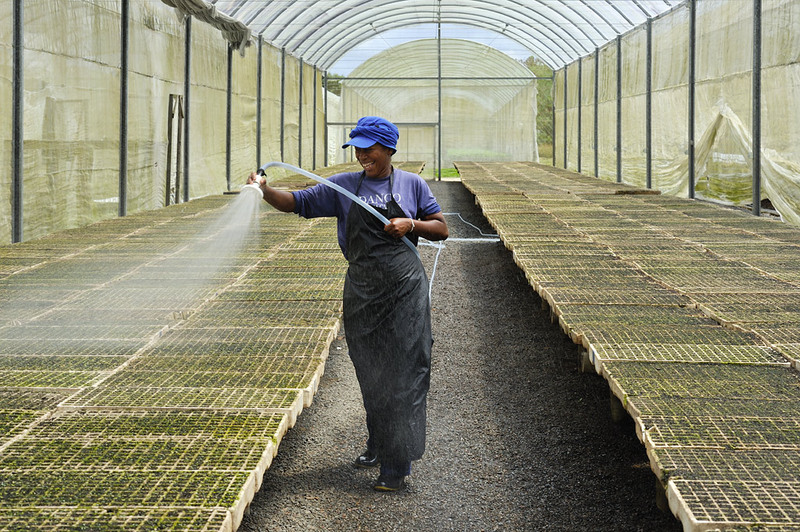 Every plant is looked after in its first five days with a litre of this treated water. Nothing is left to chance! 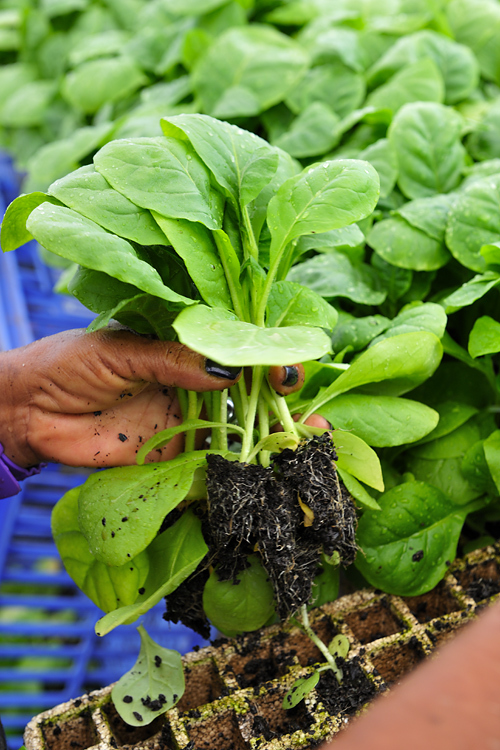 Taste, flavor, size, colour and structure of a plant are determined by the tobacco seeds, which are sowed in special pots and cared for daily. Dannemann grows its wrapper leaves individually in greenhouses, thereby controlling the conditions 100% and protecting them optimally from pests, extreme weather conditions and fungal attacks. The growth of the saplings till their replanting takes about 45 days. 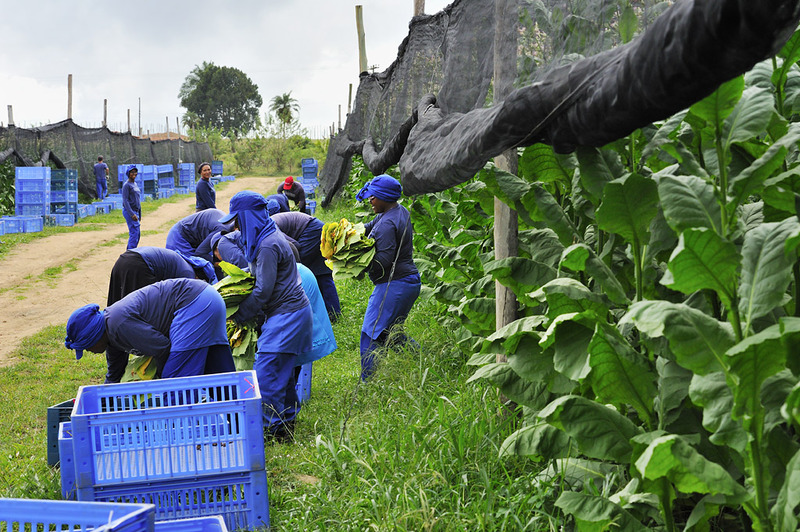 Thereafter they are about 10 cm tall and transferred to a well-prepared tobacco field. Dannemann buys the tobacco for the filling and binder of its cigars from the small farmers, who are supported and counselled by them. 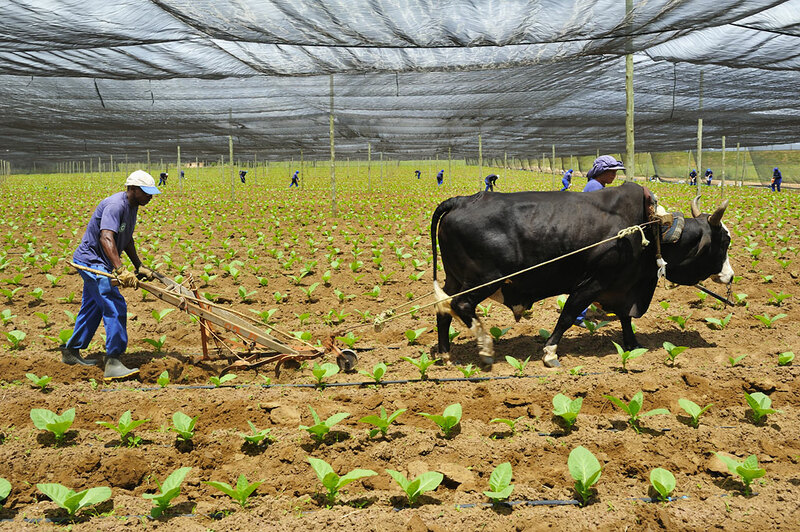 The future use of the tobacco determines from the beginning, its method of cultivation. 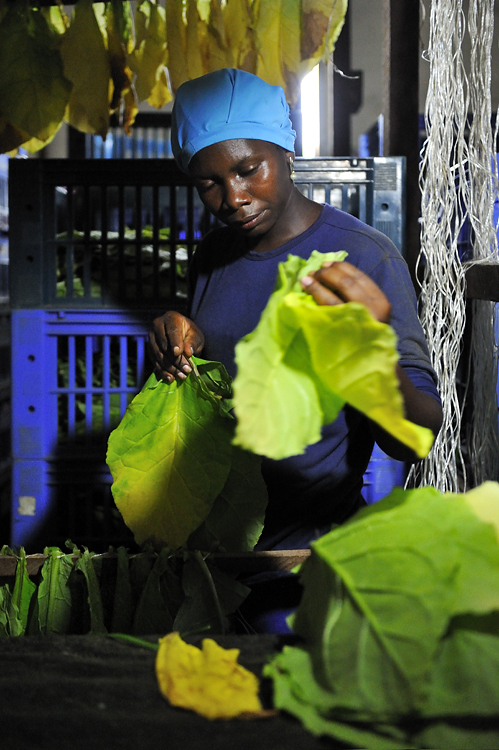 A light net protects the wrapper leaf plants from the too direct tropical sunlight (so called ‘tabaco tapado’, ‘covered tobacco’); moreover later, the flowers too are not plucked out – in this way very fine, uniform and smooth leaves are grown. 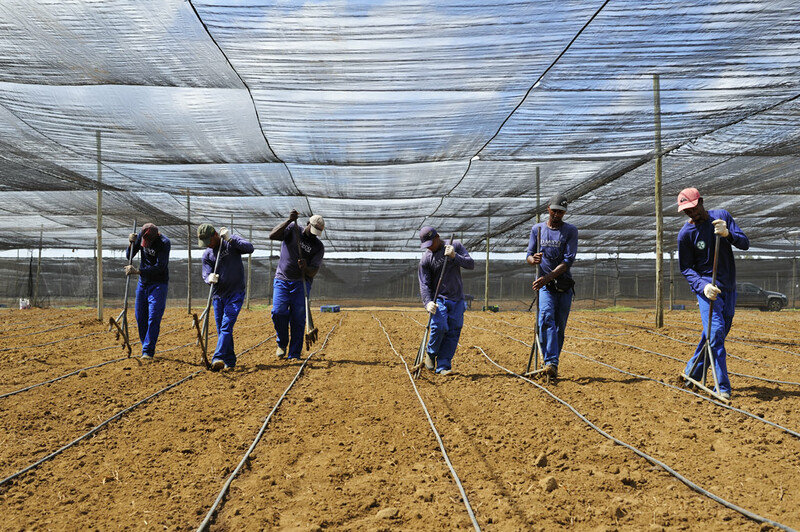 Before the female workers plant the saplings, they prepare the fields for it: they stretch the net that is to say, they repair it, they plough and fertilize the ground, they dig channels and lay the water pipes; shortly before the planting, the ground is moistened with the help of the irrigation system and then the male workers pierce holes for the individual saplings. With that the different activities between the two genders is strictly separated. 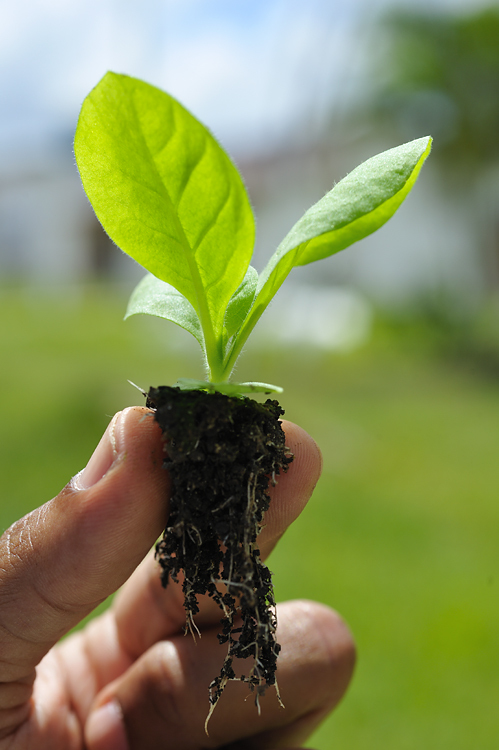 The best time for planting is afternoon, so that the freshly planted saplings are not exposed to the tropical sun for the whole day. The conditioning of the field can thus take place better. 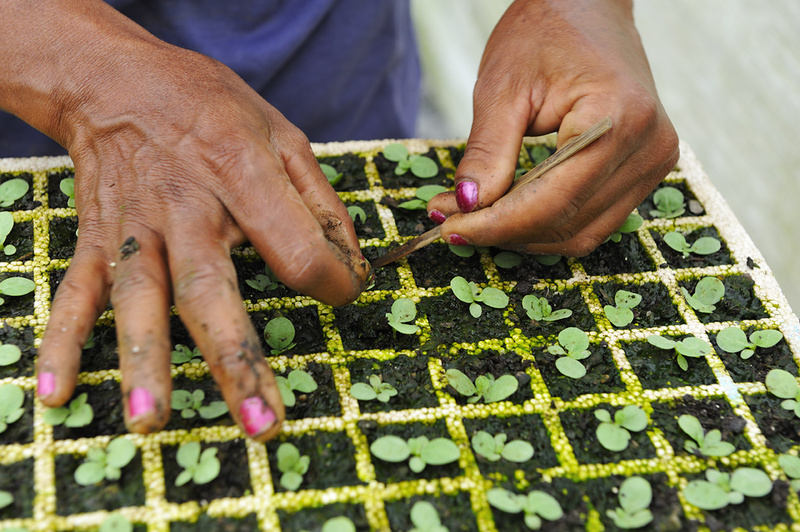 The planting happens by hand and at a high speed: the saplings are placed, well better yet, dropped, in front of the holes by the female workers, and then inserted by many nimble hands – women’s work. The maintenance of the field takes place continuously in the first few weeks and is performed manually as well as with oxen and plough: prehistoric, but very good for the plants and always effective. 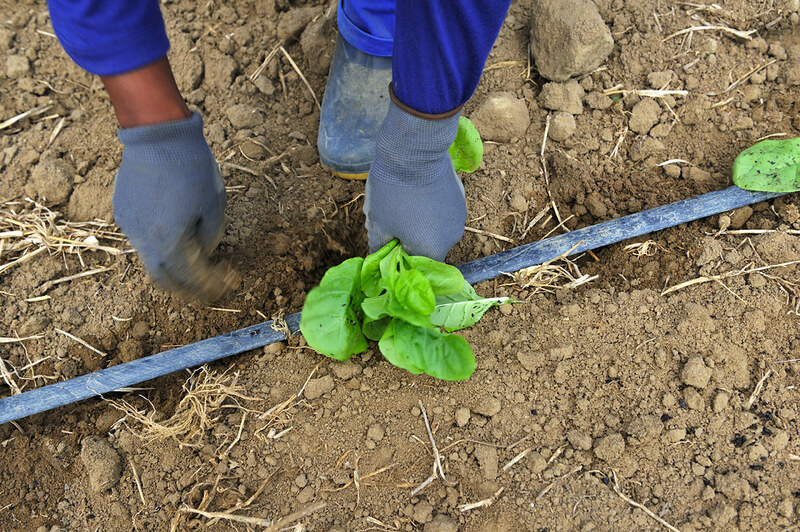 This is to prevent the growth of grass between the rows of plants, which would take away the nutrients from the plants; it therefore supplies the small plants a little more of the nutrient-rich soil. 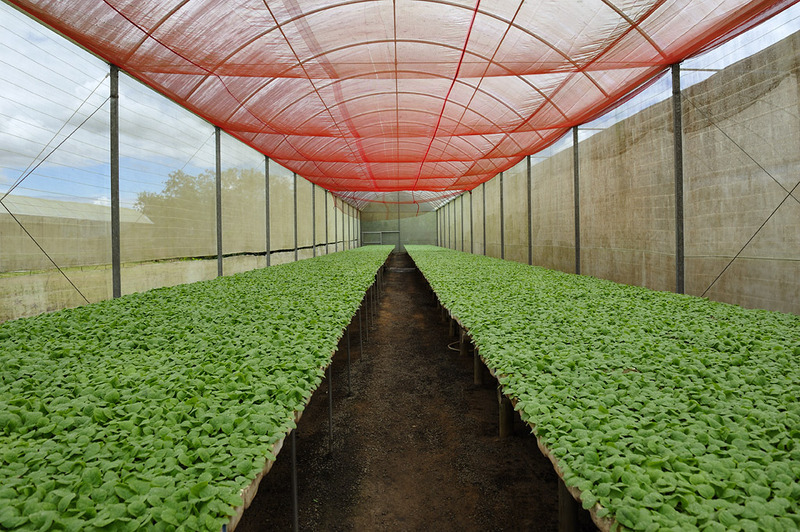 This Brazilian Sumatra tobacco is hence grown under the protective net. 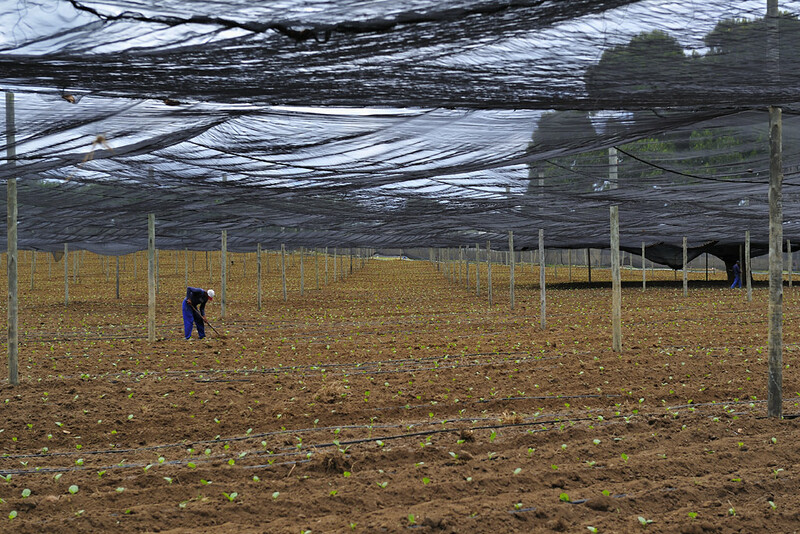 From the time they have been planted, the plants mature under the net till their harvest, which is, as a rule, about four months. 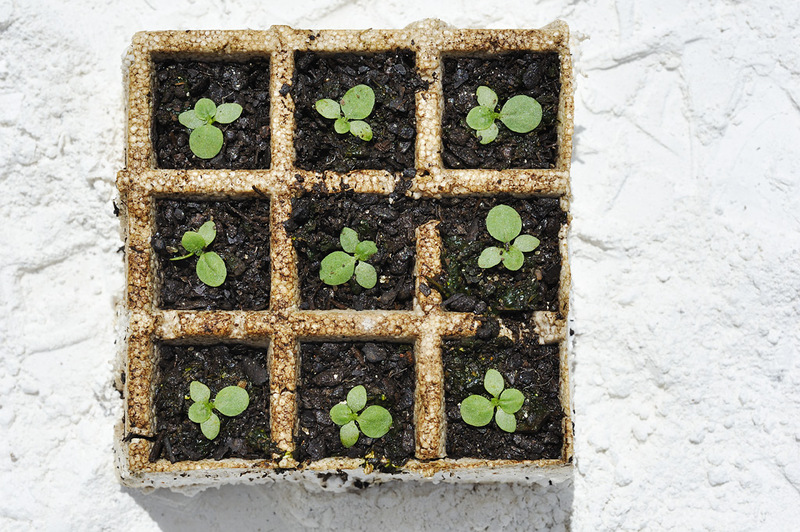 Each developmental stage of the plant has its own appeal. The (almost) grown plants give an impression of a forest, when one enters the field. When the sun shines in a field, one experiences a beautiful light effect. 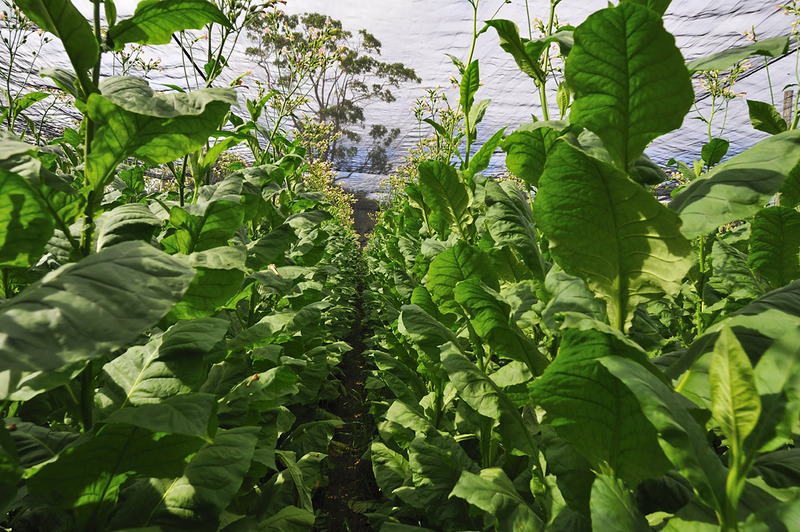 Within the rows of tobacco prevails a hot, sultry-humid climate. In the backlight, one can see beautifully and clearly, the structure of the tobacco leaf. Just as with the sowing, the beginning of the harvest is also ‘well-timed’. When it rains no harvesting is done at all. The morning dew should pass, so that the leaves are not too wet, at the same time the tropical sun should not take away too much moisture, otherwise they can become ‘listless’. 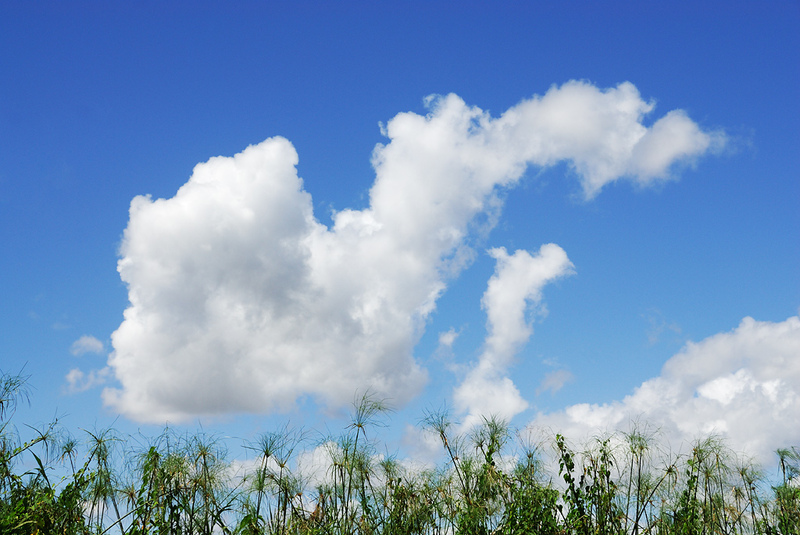 At best, during harvest, there should be a light, warm and dry wind blowing – and what else? 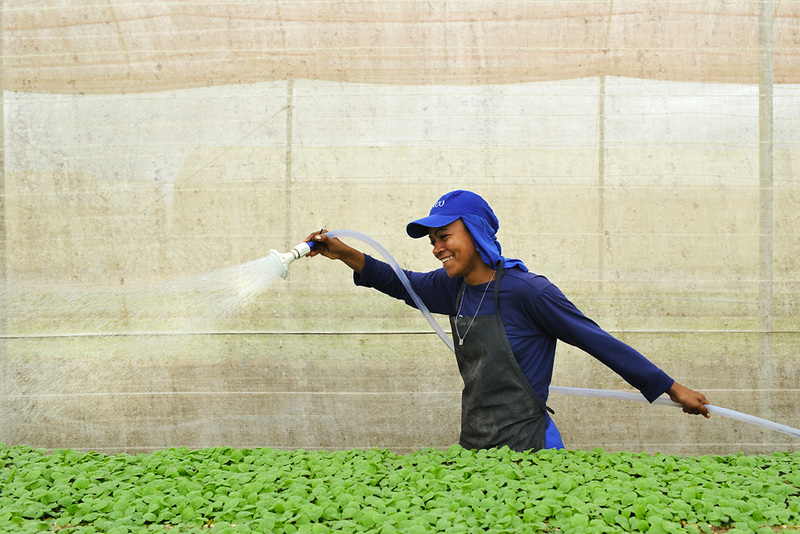 The female workers – harvesting is women’s work, transportation is men’s work – plucking of each individual leaf, as always by hand. The plucking always occurs ‘in the direction’ of the process of maturity, that is, from down to up! In this connection the specialist says, from middle part, main part and upper part (in Portuguese, it is, livre pé, centro pé e corona). Between the harvests of the various layers of leaves, lie three to eight days respectively. The plants can, in this time, recover and put their energy into the remaining leaves. 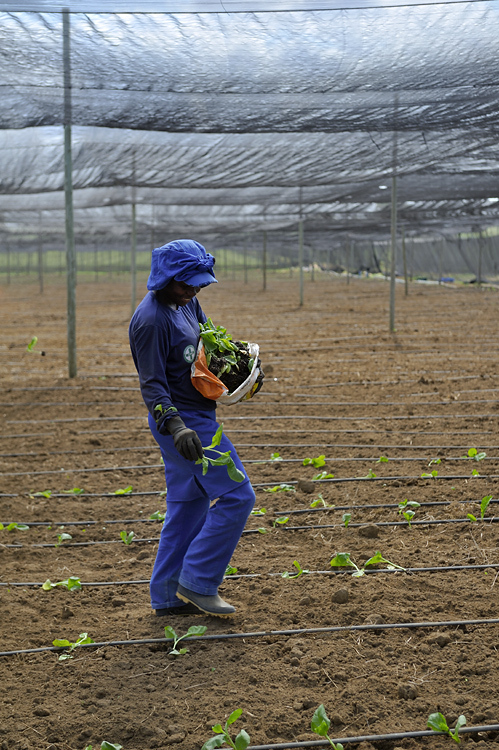 After the plucking, the female workers place the leaves in a star formation in plastic baskets, so that at the end, they can easily string and hang the leaves up to dry. On the same day the leaves are hung to air-dry. 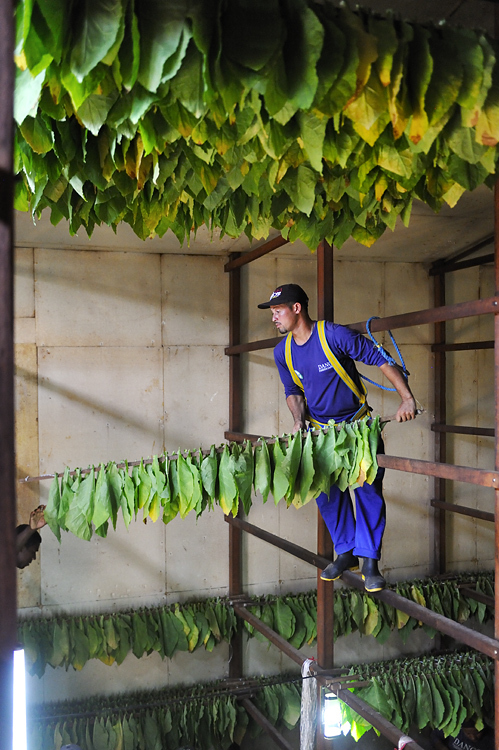 The leaves are already brought to the drying houses during the harvest. The female workers raise them up on a string, so that they do not stick to each other, otherwise they could get mould on them very quickly. This type of hanging requires a lot of space, which is why the leaves are hung from the ground up to the roof inside a wooden structure. 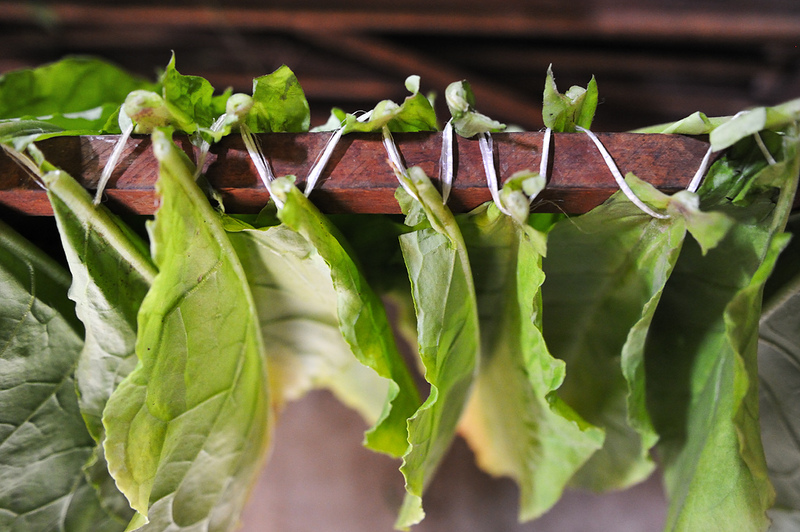 The tobacco leaves then change their chemical properties very quickly. 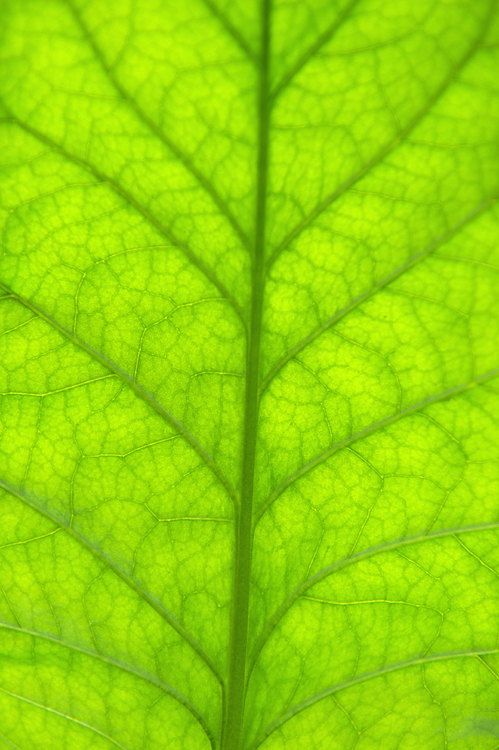 Chlorophyll drains off – that is the green colour quickly becomes yellow and then brown (see below) – in equal parts, protein, sugar and starch. 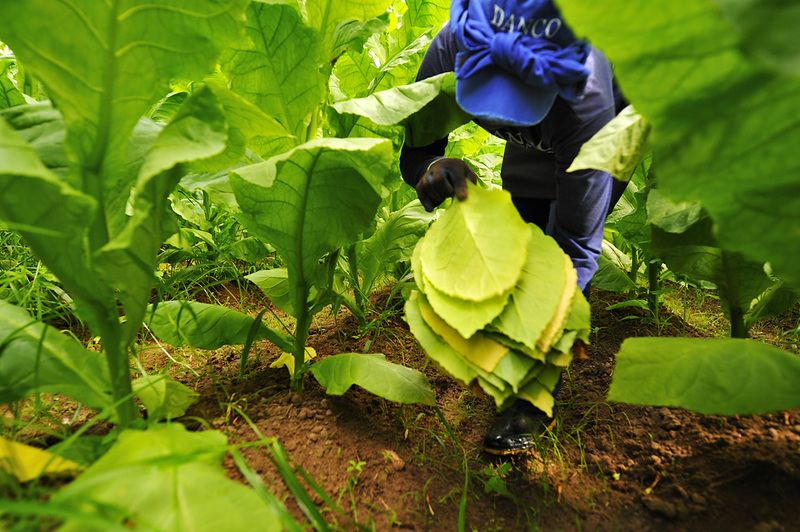 The tobacco matures within four up to six weeks, wherein the water content is reduced from 90% to 25%. „I drink a lot, I sleep little and smoke one cigar after another.